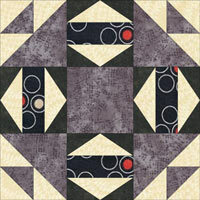 The Birds in the Air quilt block is a common unit found within many, many other patchwork designs. 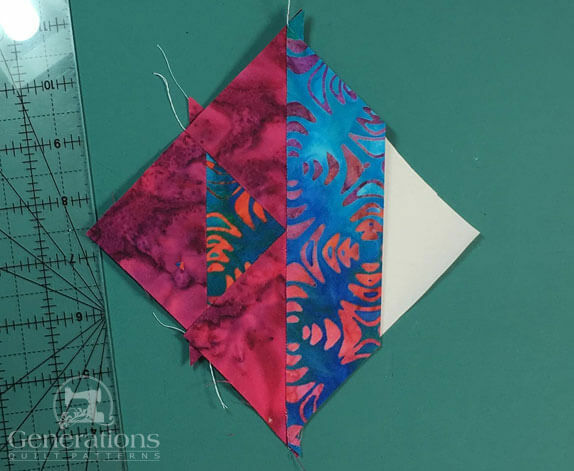 If you are making just a few blocks, traditional piecing methods work just fine. If you'd like to print this whole tutorial, click here for instructions. 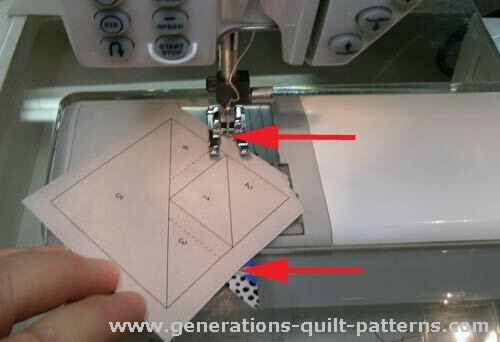 Remember that you'll need to print the paper piecing patterns separately. 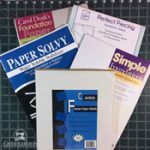 Hate paperpiecing? 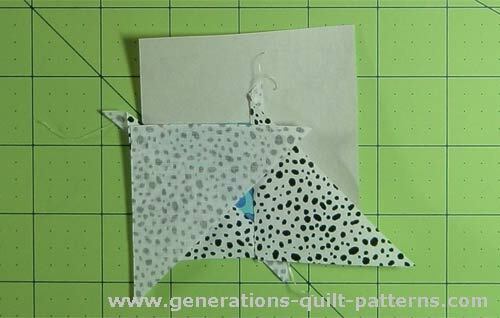 Click here for traditional piecing directions for a Birds in the Air quilt block pattern. 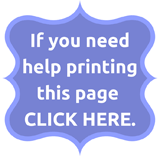 Set your stitch length to 15-18 stitches per inch to help perforate the paper. 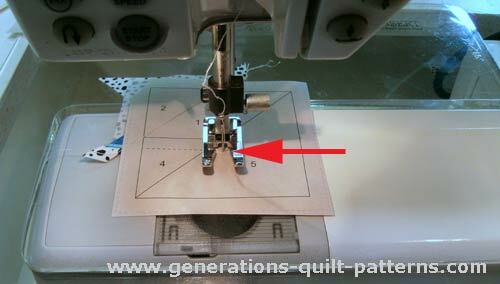 Install an open toe applique foot if you have one for an unobstructed view of the stitching line. Insert a 90/14 needle IF you have trouble removing the paper. 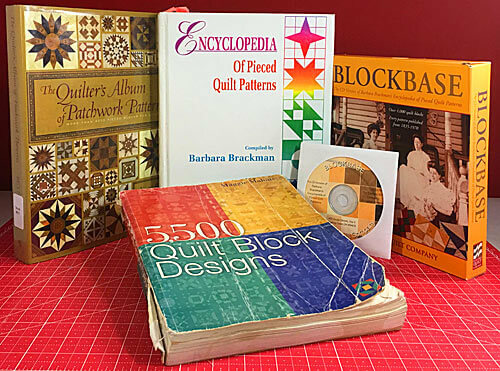 I use starch in all my piecing—paperpiecing, too! 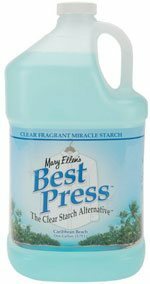 With it, I find that finger pressing is almost always good enough between patches, especially when they are small, reducing the number of times I need to go to the iron. 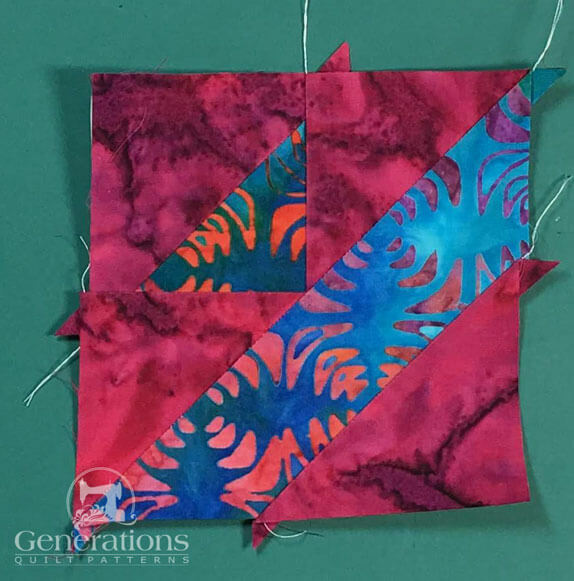 To learn more about starching your quilt fabric, click here. I do not use steam for paperpiecing, but that choice is up to you. In my experience, steam has a tendency to 'curl' the pattern...which is terribly annoying. 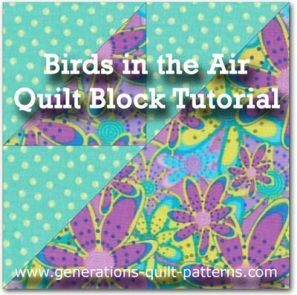 For unbelievably flat Birds in the Air quilt blocks, use the Best Technique for Pressing Quilt Blocks. 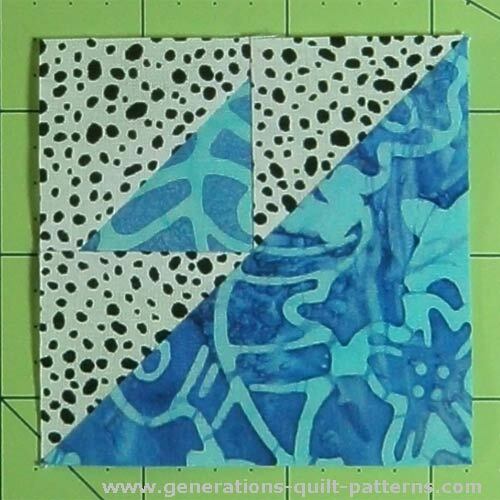 It works just as well for foundation piecing as it does for traditional. I think you'll like it! 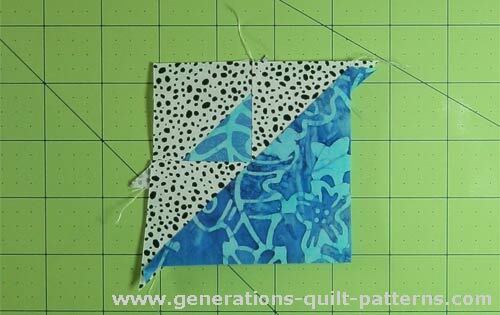 In this rendition of the Birds in the Air quilt block, I'm choosing to reverse the light and dark patches. Remember that, ultimately, fabric placement is your choice! All the patches are subcut once on the diagonal. You can download and print a copy of this design and its cutting chart here. 1	 A	 1	 1⅞"	x	1⅞"	 2⅛"	x	2⅛"	 2⅜	x	2⅜"	 2⅞"	x	2⅞"
2, 3, 4	 Bac	 2	 2⅜	x	2⅜"	 2⅝"	x	2⅝"	 2⅞"	x	2⅞"	 3⅜"	x	3⅜"
5	 A	 1	 3⅜"	x	3⅜"	 3⅞"	x	3⅞"	 4⅜"	x	4⅜"	 5⅜"	x	5⅜"
These are the cut patches. 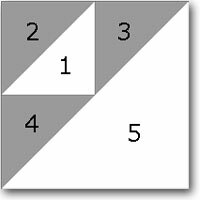 You will use three of the black and white triangles, and one each of the large and small blue ones. The rest are extras. 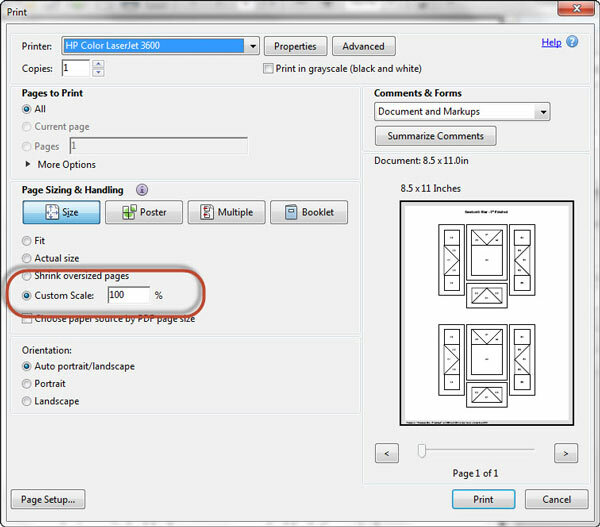 Cut a single block from the page you downloaded. There's no need to be exact, just cut outside the dotted line that marks the unfinished edge of each block. You trim it to size in the last step. 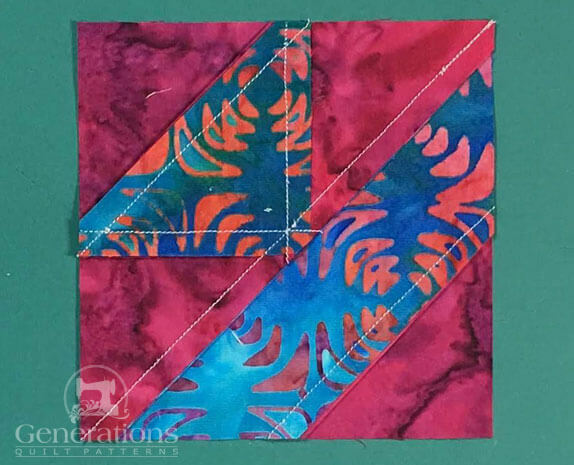 With a just a dab of Elmer's Glue Stick—the one that goes on purple and dries clear—position the back side of #1 on the unprinted side of your paper pattern so that the edges of the patch touch the dashed placement lines. 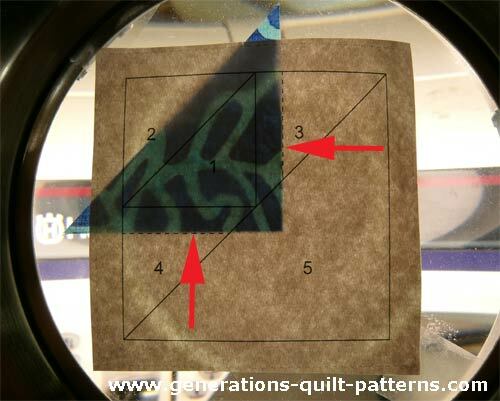 ...and stitch, starting before the line between #1 and #2 begins and after it ends by approximately 1/4" (as indicated by the red arrows). 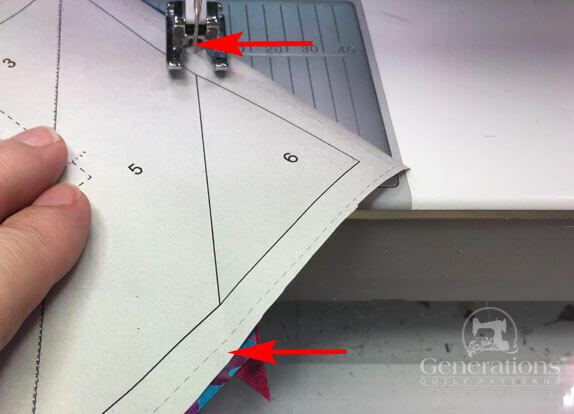 With RST, align the short side of #3 with #1 and stitch as before, both starting and stopping about a quarter inch before and after the solid stitching line. Add #4 in the same manner. At this point we haven't done any trimming yet. At this point we create a placement line for Patch #5. 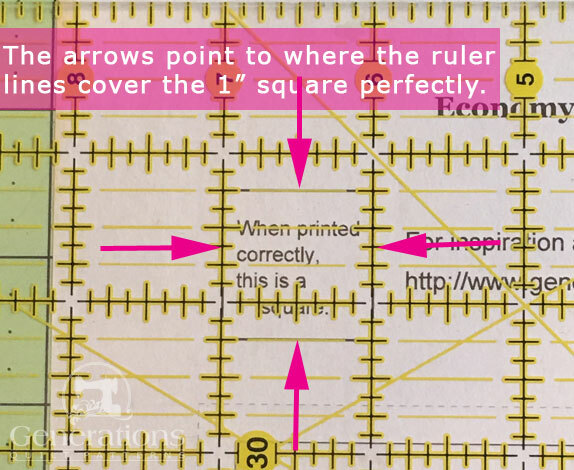 Match the edge of your rotary ruler to the solid stitching line between #3, #4 and #5. 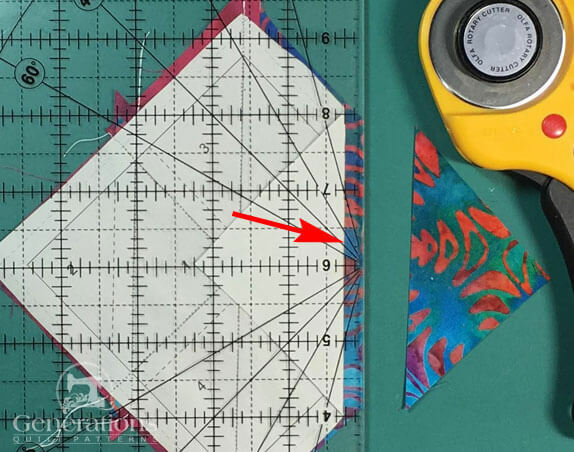 Now align the 1/4" mark of your ruler with the fold and cut along the edge of the ruler with your rotary cutter. You've just created a 1/4" seam allowance. You might like an 'Add-a-Quarter' ruler for this type of trimming. Red arrow points to the quarter inch mark. 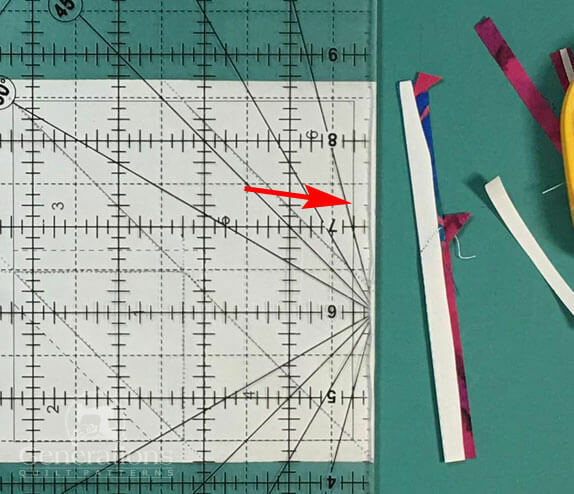 The edge of the ruler is a 1/4" away from the folded edge of the pattern. With RST, align the long bias edge of #5 with the long side of the sewn patches. Stitch, again starting and stopping before and after the line by a generous quarter inch. This is the stitched block. Up 'til now, we haven't bothered to clean up the thread tails along the outside edges. When the block is trimmed to size, it's done automatically. There's no need to make extra work for ourselves. 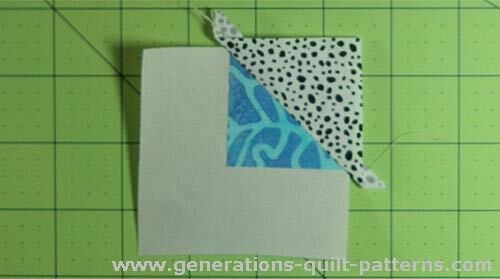 Trim the block to size by placing the 1/4" line of your ruler on the solid outside line. Trim. Repeat for the remaining three sides. 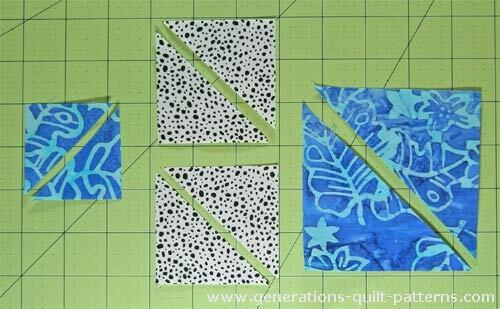 Your finished Birds in the Air quilt block looks like this. 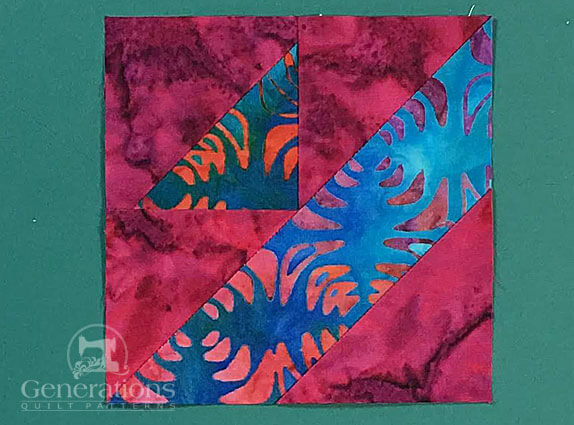 For traditional piecing instructions to make this block, click here. 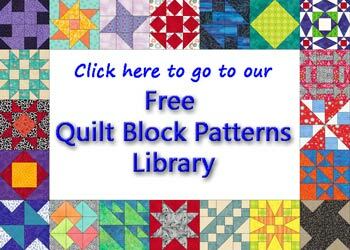 To see blocks that have the same name, but look completely different, click here. I'm using a different sample to stitch on for this unit. Use the cutting chart below. You'll have the same leftover #1, #2, #5 plus one #6. You can download and print a copy of this design and its cutting chart here for use at your cutting table. 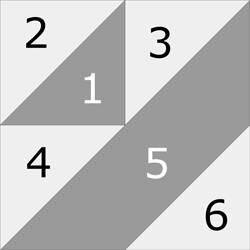 6	 Bac	 1	 2⅜	x	2⅜"	 2⅝"	x	2⅝"	 2⅞"	x	2⅞"	 3⅜"	x	3⅜"
Print the pattern to match your chosen Finished Block Size. To make it follow the instructions for Patches #1-#5, just leave out the last trimming to size—we've got one more patch to add. 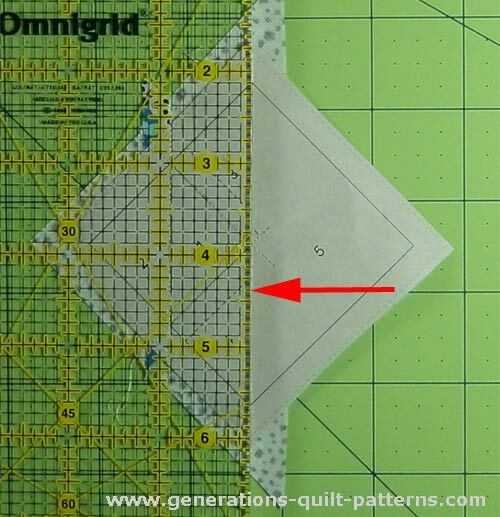 At your cutting mat, paper side up, line up your ruler with the solid line between #5 and #6. Crease the paper along this line with your thumbnail. 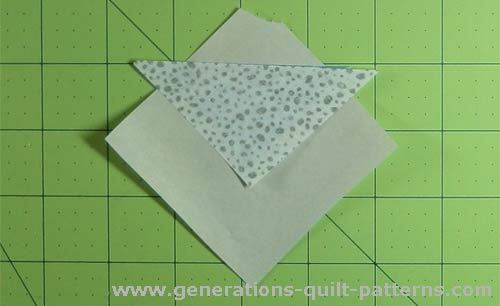 Fold the paper back on itself and place the 1/4" line of the ruler on the fold. Trim away the excess leaving behind a quarter inch seam. After trimming #5 this is what it looks like from the fabric side. 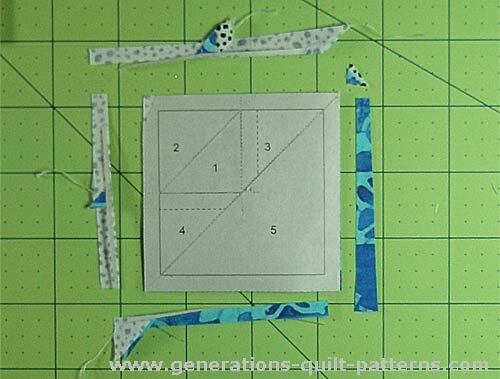 Align the long bias edge of a #6 with the cut edge of #5. Stitch as before starting and ending a generous 1/4" from the solid line. Give your block a press before trimming. Now to create our perfectly sized block and get rid of thread tails. 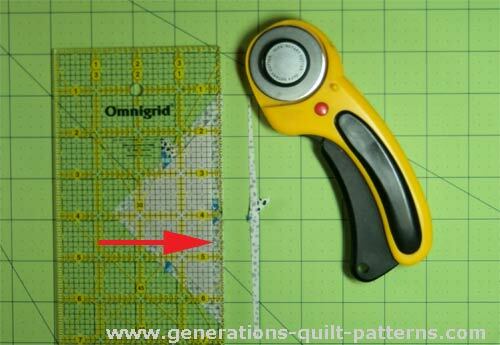 To trim, lay the quarter inch markings of your rule (red arrow) on the solid outside line and trim. Repeat for the remaining three sides. Our finished Birds in the Air variation after trimming all four sides. Here is our Birds in the Air variation from the back. "Green Tea and Sweet Beans"